Bracelets are not only fast and easy to make but they are nice addition to any garment when you choose the right colour(s). 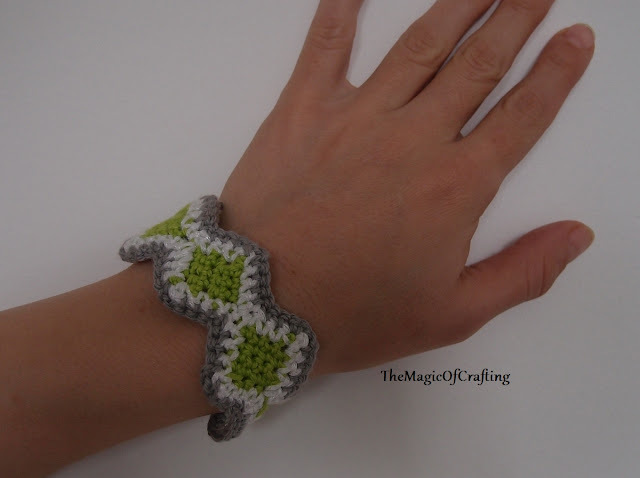 This bracelet design will attract everyone's attention. Note: Only chain and sc are used for this pattern. 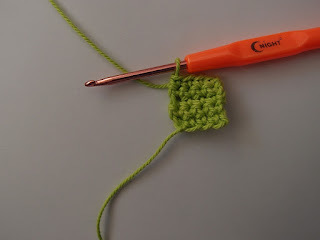 First I have made a guirland of crochet squares. Ch 5, sc in second hook from st, sc till the end(4st). Turn. Row 2-5: ch 1, sc in same st, sc till end (4 st). Turn. 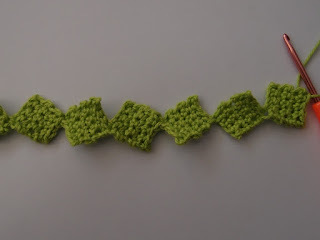 Do not cut the yarn when you finish the square but continue with the next square (ch 5, then make a square), make 7 squares or less/more depending on the hand. 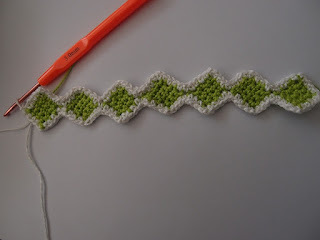 Join white and make a row of sc all around the bracelet. On the top corners make sc, ch, sc in the top st. End with ss in the first sc. 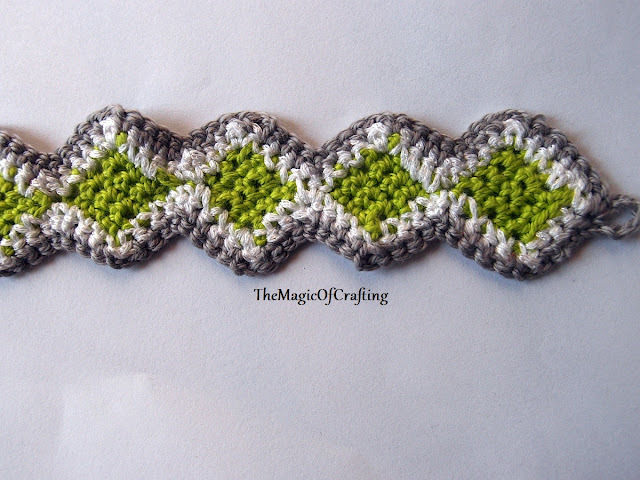 Join grey and make another round of sc around the bracelet, skip the corner sc down, on the top corners stitch make sc, ch 2, sc to make straight edges. Before cutting the yarn ch 5-6 and end with ss at the first chain. It will be used as button hole. 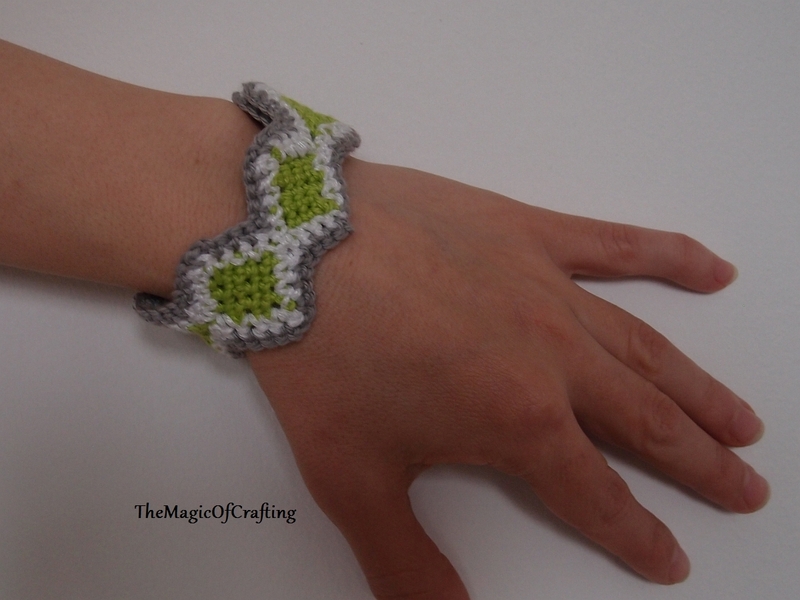 Sew small button at the other side of the bracelet.